In a move destined to improve US/China relations for years to come, the Chinese have quarantined woefully inept New Orleans Mayor Ray Nagin after a passenger on his flight overseas showed symptoms of the H1N1 virus, popularly known as swine flu. Nagin, currently embroiled in a scandal in which city contractors allegedly financed tropical vacations for him and his family, is currently being held in a Shanghai hotel, along with his wife and a staffer. According to the Times-Picayune, the three were part of a six-person team traveling abroad for ten days. The Nagins and four City Hall staff members left Friday for the 10-day trip to China and Australia aimed at luring industry to New Orleans and discussing government's role in mitigating climate change, his office said. The three, who were quarantined as a pre-caution, were sitting close to a passenger who showed "signs and symptoms of an influenza-like illness suspected to be of the H1N1 subtype," according to a statement from Ceeon D. Quiett, Nagin's director of communications. But the three are symptom-free and are "being treated with utmost courtesy by Chinese officials," Quiett said. She said she didn't know how long they would be quarantined. Interestingly, this isn't the first time that Nagin, recently cited as one of the most unpopular politicians in the history of American politics, has been quarantined inside of a hotel room. According to Presidential historian Douglas Brinkley, a paralyzed-by-fear Nagin quarantined himself on the 17th floor of the New Orleans Hyatt while the city spiraled out of control in the days after Hurricane Katrina struck, a contention Nagin has vigorously denied, but one that just about anyone who's followed his horrendous stint as leader of the city has little trouble believing. Finally, as someone who hails from the New Orleans area, I think I can speak for everyone who cares deeply about the city when I say this to the Chinese government—-Please, PLEASE, keep him there as long as needed. 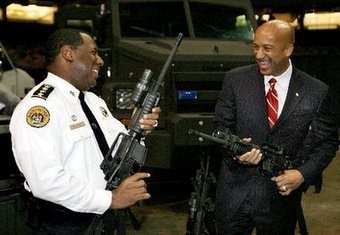 We want to make sure Mayor Nagin is safe and well and healthy. Feel free to keep him until at least November 30, 2009, the date which marks the official end of the 2009 hurricane season. Seriously.